ASAP Drains - Drain/Sewer Clearance based in Chatham, Kent. 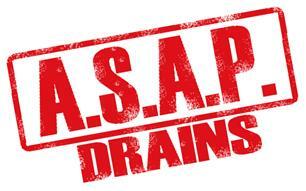 ASAP Drains are a local, independent company that offer a quick and cost effective service. Services include: CCTV surveying of drains and Clearing of Blocked gutters, downpipes, drains, WC,s, sinks, gullys and soakaways. Main areas covered include: Maidstone, Chatham, Rochester, Gillingham, Gravesend, Sittingbourne, Isle of Sheppey, Sheerness, Faversham, West Malling, Kings Hill and all areas in the Kent area. All drains are cleared at a fixed rate using high pressure jetting, normally on site no more than one hour. We have the latest CCTV equipment to investigate any faults, and can arrange to carry out any repairs. We are always happy to advise, or answer any queries you have, and will always leave you totally satisfied, please call 07886 635848 for assistance.